February 26, 2019 Book Tips and Sips. I get to talk with Texas Book Festival’s Julie Wernersbach about books at Prohibition Creamers! Come have fancy cocktails. February 5, 2019 Join me at the actual magnificent Writing Barn for a benefit for Women for Women International called Words with Wine. I’ll be reading letters from women in countries recovering from war and their journeys to social and economic empowerment. February 3, 2019 I’m trying my hand at my first online class at the magnificent Writing Barn. 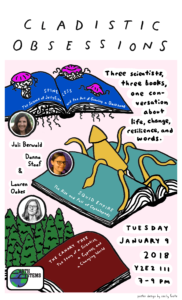 Join us from 2 to 5 before the Superbowl to talk about Science as Metaphor and Motivation. January 26, 2019 Austin Public Library St. John Branch. What could be more fun than a jellyfish and narwahl party – with waffles, of course! November 13, 2018 Friends of the Round Rock Library Literary Locals with a whole slew of fabulous Austin-area authors. November 12, 2018 St. Louis Jewish Book Festival I’m beyond thrilled I get to take part in one of the oldest and best Jewish Book Fairs around. I remember seeing Chiam Potok there as a kid. November 7, 2018 Book Lover’s Luncheon at the Austin Jewish Book Fair This is a big deal for me. I think the seeds that I might one day be able to write a book started when I volunteered for the AJBF over a decade ago. November 5, 2018 Detroit Jewish Book Festival at 11 am The mother of all Jewish Book Fairs. Honored to take part. October 20, 2018 Oklahoma Book Festival at 1 pm. In the boathouse, appropriately! September 22, 2018 ATXSciWri Collaborative Workshop: Bridging the Space Between the Lab and the Press Come to this one if you’re a science communicator. I’m thrilled to have the chance to share great conversations about scientists and writers with Susan Hovorka and Marc Airhart, both from UT. September 1, 2018 THE National Book Festival!!! In conversation with the one, the only, the fabulous Sy Montgomery!! Washington, D.C.
August 19, 2018 Tumble: The Live Show at the Scottish Rite Theater in Austin, TX. It’ll be jellyfish and so much more sea creature sensation! May 24, 2018 Austin Public Library. In conversation with Jack Davis who wrote the extraordinary, Pulitzer Prize-winning The Gulf. 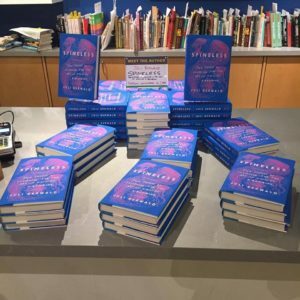 May 23, 2018 Watchung Booksellers in Montclair, New Jersey. April 7, 2018 I’m really looking forward to being part of San Antonio’s Book Festival! Join us at 11 am. February 16, 2018 AAAS comes to Austin! I’ll be doing a reading at 4:30 and hosting a meet and greet at 2:30 in UT’s Austin Lounge. Stop by! February 21, 2018 Speed Spineless is happening at Austin’s Pecha Kucha, where I rise (hopefully) to the challenge of explaining the entire book in 6 minutes and 40 seconds. January 9, 2018 at 7 pm Stanford University. This is going to be EPIC! And how freaking cool is this event poster? January 8, 2018 at 7 pm. Bookshop Santa Cruz. 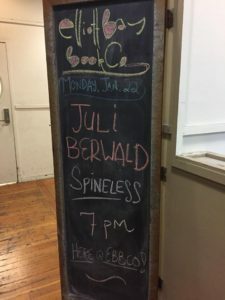 Thrilled to travel to the other weirdest bookstore in the world to talk Spineless. January 6, 2018 at 6 pm. San Francisco JCC. Science on the Screen features the gorgeous movie Ponyo and we’ll talk about the way jellyfish are depicted on film. You can buy tickets here!